Successfully Added HK Warehouse Blackview A8 Max Smartphone - Android 6.0, 5.5 Inch HD Display, Quad-Core CPU, Dual IMEI, 4G, 3000mAh (Gold) to your Shopping Cart. The Blackview A8 Max, a budget phone that will rock your world. This Chinese smartphone runs on an Android 6.0 operating system and holds all the features one would normally only expect from an high-end smartphone. Its sleek and beautiful full metal alloy casing holds some serious hardware and gives this Android phone a stylish look, making it a perfect device from both outside and in. Featuring Dual-Sim card slots this Android smartphone allows you to insert two SIM cards from different providers simultaneously. Thanks to its Dual IMEI numbers you can now be connected to both your phone number simultaneously, providing you a perfect platform on which to separate business and private life. 4G connectivity additionally provides you with the fastest data speeds out there. Browse the web effortlessly, download files in the blink of an eye, or stream online movies in lightning speeds – with the Blackview A8 Max you can enjoy a truly smooth online experience free of any lag and interruptions. A large 5.5 inch display lets you enjoy all your favorite Apps and media in stunning HD quality. Holding some serious hardware this budget Android phone features a Quad-Core CPU that has been clocked at 1.3GHz and has 2GB of RAM. Enjoy the latest applications, HD movies, and the most demanding games, the Blackview A8 Max will handle what ever you throw at it without losing a single frame. With a massive 3000mAh battery this Chinese mobile lets you enjoy up to 10 hours of continuous usage time, enough for you to enjoy all your phone’s favorite features to the absolute most. 16GB of internal storage and the possibility to add an additional 64GB of external memory provides you with enough space to save all your files and media. Why not head out to the Google Play store and download one of the millions free games, movies, apps, or files and enjoy them on your stunning 5.5 Inch HD display – with the Blackview A8 Max there is no need to worry about storage space any time soon. Equipped with an 8MP rear camera this smartphone additionally allows you to shoot your own pictures and video’s in mesmerizing HD quality, allowing you to capture and share all special moments in life with your friends and loved ones. 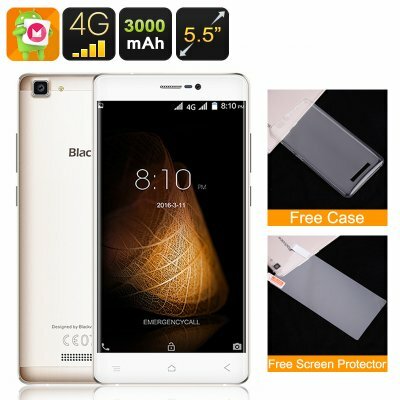 The Blackview A8 Max comes with a 12 months warranty, brought to you by the leader in Android smartphones as well as wholesale electronic gadgets..